Click on the thumb nail picture below for a larger picture of Emily. It was taken here at the kitten farm on June 17, 2004. 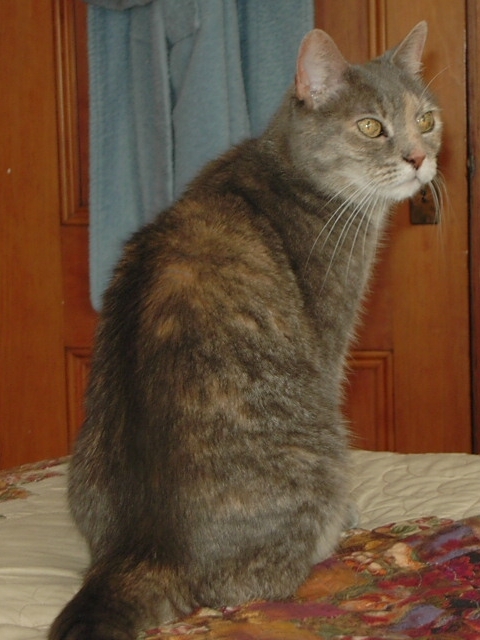 Emily is a dilute calico, born 10/02/1989. Sadly, after her owner's daughter moved in with a second cat, Emily developed litter box problems. Her owner took Emily to a vet to have her put down. The vet declined, because for a 14 year old cat Emily is in very good health. PAWS of Wakefield found her a foster home until we visited and adopted her the same day we picked up the boys. While Emily is not perfect with her litterbox (lousy aim every few days), we suspect the previous owner's problem was the classic too many cats making the litterbox dirty. Here at the kitten farm, we have three litterboxes, all cleaned at least twice daily. Emily is a rather sedate and regal cat. Alas, she doesn't especially like the boys. They didn't do anything for their cause by stalking her repeatedly the first few days we were all one big happy family.